Crest of Hope: Patamon's World - bringing Digimon info to you from an Animaniac (=Anime maniac) in Australia! It all started back in February 2001. I was 11 and a half years old, just starting Year 9 at school, and I already knew more about computers than my IT teacher. We'd just upgraded our computer to a 733 MHz Celeron, with Win98 SE and Office 2000 Premium. Now, if you know about the different releases of Office, you'll know that Office 2K Premium includes FrontPage 2000, and I got to know the program straight away. Cut to early 2002. By then, Digimon had been screening on free-to-air TV for a year or two, but I'd never really watched it. I've always been an all-out Pok�maniac and I thought Digimon was just some cheap rip-off of Pok�mon. Boy, was I wrong! I watched a bit of Digimon while waiting for another show to come on, and I was hooked! I watched it every week for months, and then I had an idea. What better way to communicate my new knowledge to the world, than to make a website? That idea became Crest of Hope: Patamon's World. 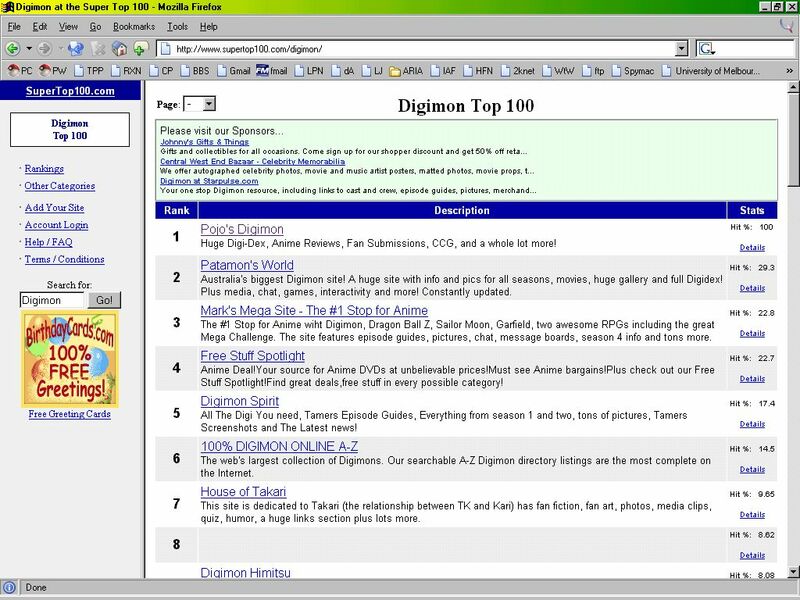 I set up an account with Netfirms and first published, using basically all placeholders, in June 2002. I left it there, as I had exams to worry about and heaps of schoolwork to do. I had absolutely no hits. At the end of November 2002, I came back to the site, and formally opened it on December 1, 2002. I worked really hard for about a month and got as much content up as I could. Of course, it's not finished yet. It'll never be finished - there's always more to add. Since then, affiliates have come and gone, and a lot of people have joined the site as news updaters, article writers and forum mods. These days, I'm getting a couple of thousand hits a day, which puts me comfortably in the small-to-midsize Digimon site bracket. A new chapter in PW's history started in late April 2004. When I reopened the Pok�mon Peninsula, one of the things that people commented on at the Pok�mon Community was the intrusive ads on Netfirms. After I explained that I couldn't pay for hosting, a member there, JKaizer (Greggy), offered to host both TPP and PW on his own personal hosting account! Thanks Greggyboo, I promise I'll repay you someday. Although I didn't make any content updates between April and November 2005 (that's over half a year without - eek, let me go put my lunch in the microwave - k, I'm back - a real update! ), I had been spending time converting the main part of the site (that means everything but the Digidex) to PHP. This involved recoding every single page, due to Frontpage's fugly coding. Somewhere during those months, my hard disk died with PW on it, and I lost several weeks while we ordered a new computer, configured it (I installed three operating systems -_-) and very slowly retrieved data from the dead disk, managed only with the help of HiKaizer's dad. I finally finished the recode just before my final first-year exams, and the major update went up on November 2, 2005 - with its own domain! Greggy and I had paid for a web hosting upgrade using the money I got from my sister for my birthday, and our host, Elixant, had a special on at that time which involved a free domain for the lifetime of the account, so we switched ryux.net to the lifetime one and I convinced Greggy to register digivice.net to replace it. ^_____________^ Also, a couple of weeks before this, we registered our 2 millionth pageview, which isn't too bad for a small site. It's never nice to say goodbye to a friend, but many of the sites I once affiliated with closed down or stopped updating. Special thanks goes to Tim Casey, who's the webmaster of the Anime Edition. 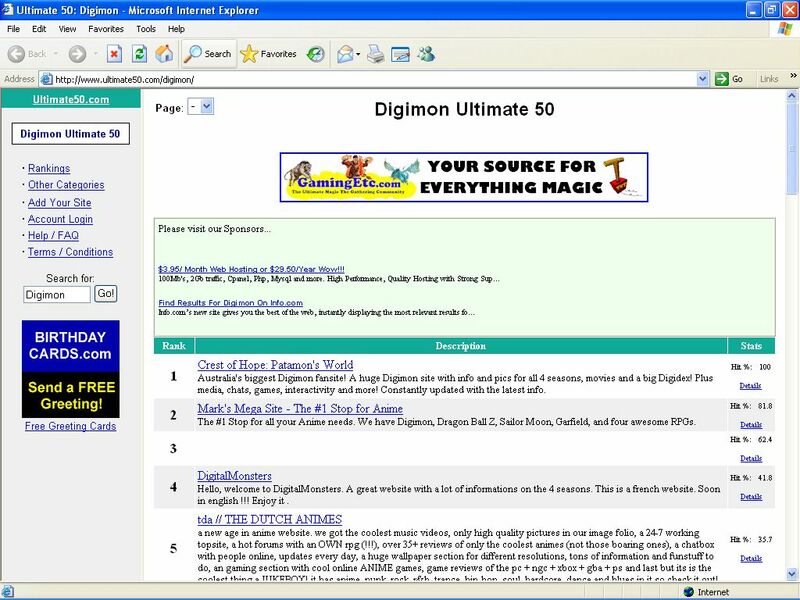 His Digimon section has now closed, but it was my first affiliate and the site that first promoted my website on the Net.